As well as the dry, stark beauty of the landscape, being in the rainshadow means that Mustang is a good place to go trekking when much of the rest of the country is inaccessible due to the rains. The common wisdom you’ll hear about Nepal is not to go trekking during the monsoon, as the views will be obscured by clouds and many trails will be slippery and muddy, if accessible at all. This advice doesn’t apply to Mustang, making it a great destination for travellers who want to travel in the Northern Hemisphere summer. Mustang borders Tibet, and the culture is Tibetan in many ways. Buddhist monasteries, chortens and stupas, prayer stone walls, monks in red robes, and women in colourful striped Tibetan aprons are common sights. The mud-walled towns typical of the region are unlikely many places you’re likely to have seen before. Mustang is divided into two sub-regions, Lower and Upper. Travellers were prevented from entering Upper Mustang until 1992, and even now, visiting requires the purchase of a $500 10-day permit, and independent travel (without a guide) is not allowed. 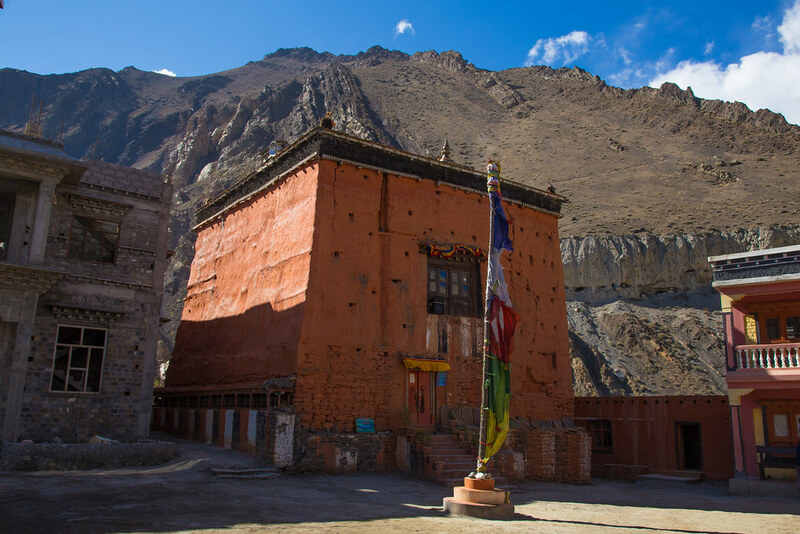 Lower Mustang is much more accessible, although the town of Kagbeni is as far as foreign tourists are allowed to go without an Upper Mustang permit. Jomsom is the gateway to Mustang, reached via a long, bumpy bus ride or a short, very scenic flight from Pokhara. Flights depart early in the morning because the high winds that whip through the Kali Gandaki Gorge from late morning can make flying treacherous. Flights are frequently cancelled due to the weather. While the flight can be a nail-biting experience, it only lasts a brief 25 minutes, as opposed to the 10+ nail-biting hours on the bus! In Lower Mustang, especially Jomsom and Kagbeni, there are a number of good quality guesthouses, as well as more basic trekkers’ teahouses along the end stages of the Annapurna Circuit. Accommodation in Upper Mustang is a bit more basic, and camping may be required if taking any side-routes. Traditional treks are the preferred method of travel to and within Mustang, but horse treks are also possible, and a good idea for trekkers with children. 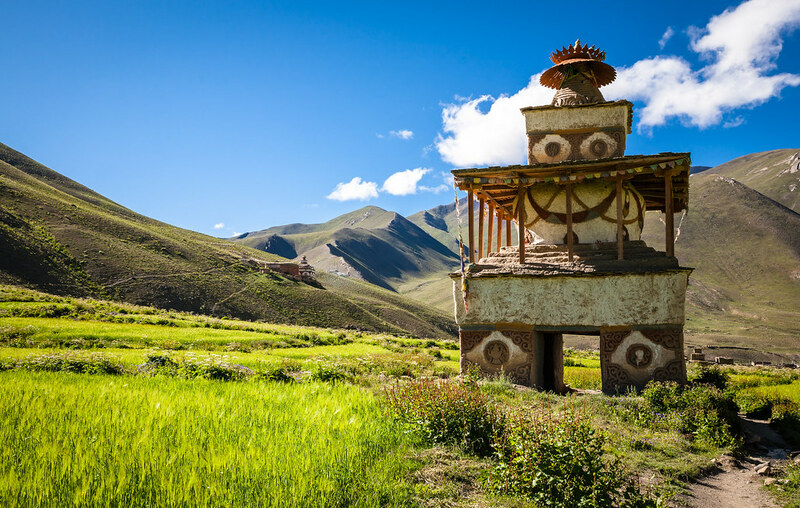 This is the best trek to get a thorough overview of the entire Mustang region, because it starts in Lower Mustang and continues all the way to Lo Manthang. Along the route you will see medieval meditation caves, some of which contain amazing paintings. The trek culminates at Lo Manthang, the small capital of Upper Mustang, and the seat of the erstwhile kings of Mustang, an independent Tibetan kingdom. Around two weeks is required for the Upper Mustang trek. An extension can be made to Damodar Kunda, a high-altitude lake to the east of Upper Mustang that is an important pilgrimage site for Hindus and Buddhists. From Lo Manthang, Damodar Kunda is a three-day walk, via a high pass. The return trek to Jomsom passes through Muktinath. This extension requires camping. Using Jomsom, Kagbeni and/or Marpha as a base from which to explore Lower Mustang is a great alternative to a multi-day trek in Lower Mustang. It’s still possible to do a number of invigorating day hikes while retreating to more comfortable accommodation in the evenings; this option is ideal for travellers short on time, those who aren’t confident doing multi-day treks, or those with children. The hike between Jomsom and Kagbeni, up the Kali Gandaki Gorge, takes a few hours, as does the steep uphill trek (along the road) from Kagbeni to Muktinath. From Kagbeni there are a number of walks to monasteries and meditation caves. Lubra is another good destination from Kagbeni, as it is one of the few places where the pre-Buddhist Bon religion is still practised. All walks in Mustang should be set out upon as early in the day as possible, to avoid the biting winds that whip up from late morning. The final couple of days on the Annapurna Circuit descend into Lower Mustang, so doing this classic trek is one way of experiencing some of the Mustang region while not dedicating your entire trip to the region. Perfect for first-time Nepal visitors, or trekkers who want the variety of passing through several regions. After crossing the famous Thorung La, the trail descends to the holy temple at Muktinath, then down to Kagbeni and onwards to Jomsom. These days, most travellers drive or fly back to Pokhara from Jomsom, as the construction of the road in the area has changed the traditional Annapurna Circuit route. However, there are alternative trails in Lower Mustang that avoid the road, so if you have any stamina left after completing the Circuit, there’s no need to rush straight back to Pokhara. For an epic adventure, it’s possible to combine three favourite trekking regions into one trek. The route from Rara Lake to Jomsom via Upper Dolpo requires a lot of time, stamina and fitness, and it’s necessary to camp most of the way. There are several 5000 metre-plus passes to cross on this trek, so your fitness and trekking experience levels should be very high. But, it is very rewarding for experienced trekkers. Begin in Jumla, in western Nepal, which can only be reached by a flight from Nepalgunj, on the Western Terai. After a couple of days, reach Rara Lake, a beautiful blue lake surrounded by forests. 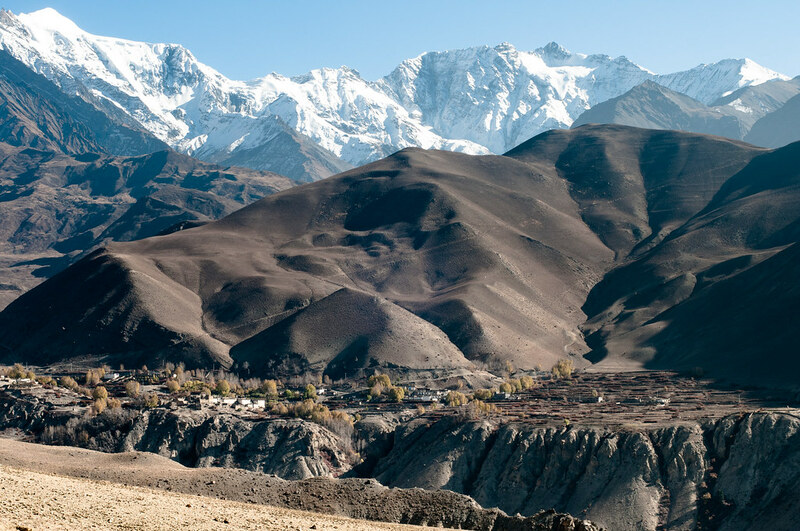 Then, cross into Upper Dolpo, a region that, like Upper Mustang, is in the rainshadow of the Himalaya and is only accessible with a special permit. Finally, cross the Bhima Lojun Pass down into Jomsom, in Lower Mustang, an approach to the region that very few trekkers experience. Itchy feet? Explore our hand-crafted trekking holidays in Nepal, with only the best local guides and hosts.